"Rowland Lake and Rowland Basin, Washington"
Click image to enlarge Rowland Lake, Washington. View from Old Highway 8, looking southwest. Image taken June 15, 2012. 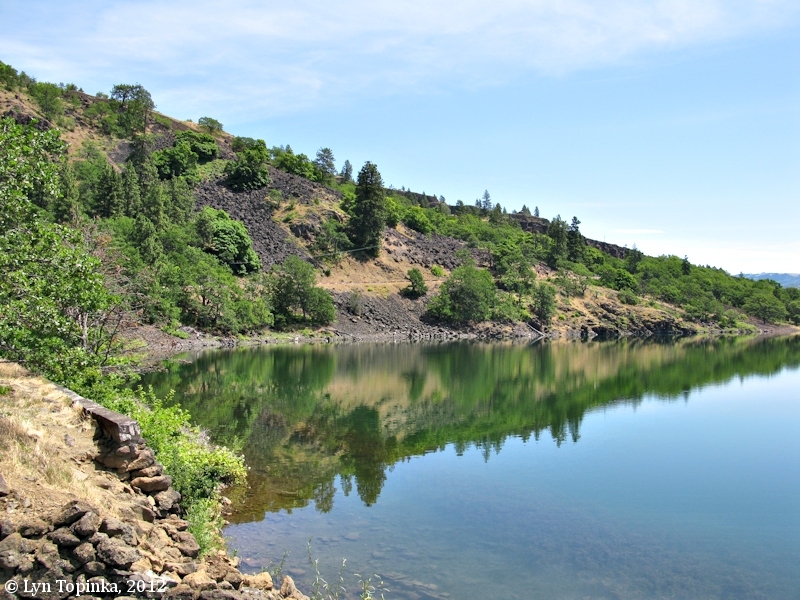 Rowland Lake, once called DeBois (DuBois) Lake, is a small lake located on the north side of the Bonneville Reservior at Columbia River Mile (RM) 176, four miles east of Bingen, Washington. The lake is nestled in the sloping backside of "Coyote Wall", an anticline/syncline feature of the Bingen Gap. 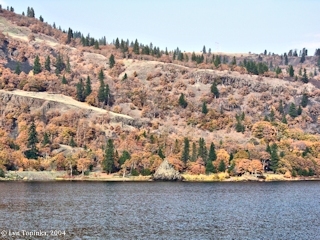 Rowland Lake covers nearly 85 acres and is connected to the Columbia River via a culvert. Washington Highway 14 cuts through the lake. Upstream of the lake is Catherine Creek, Major Creek, Hewett Lake, and then the Klickitat River. 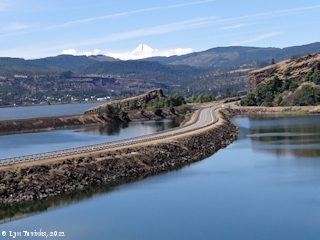 Rowland Lake, originally called "DuBois Lake", was originally an arm of the Columbia River. "This lake is located four miles east of the town of Bingen and is split by SR-14. This lake has two fishing openers. The first is the last Saturday in April and remains open through the Sunday before Thanksgiving. The second opener is the Friday after Thanksgiving, "Black Friday opener". The lake remains open through February. Only the north lake is stocked with trout. Thousands of catchable rainbow and hundreds of rainbow broodstock are planted in late December, early January. Broodstock can be to eleven pounds. Thousands of catchable rainbow are planted prior to the April opener, including triploids, and again in June. In November 2000 jumbo rainbow, about 1.25 lbs each are planted for the Black Friday opener. 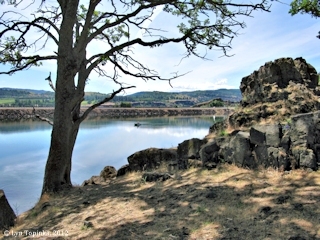 Largemouth Bass, bluegill, and some crappie are also caught here.There is limited very rocky shore access available and a rough WDFW unimproved boat launch on the north side of the lake." Source: Washington Department of Fish & Wildlife website, 2015. "Formally called DuBois Lake, Rowland Lake covers about 85 surface acres and is located about one mile east of Locke Lake. 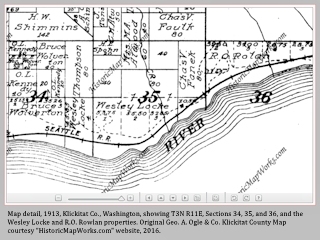 It was originally an arm of the Columbia River and was formed by rock fill when the railroad was constructed. Still connected to the Bonneville Pool by culvert, Rowland hosts a variety of fish species including planted rainbow trout and lots of largemouth bass. 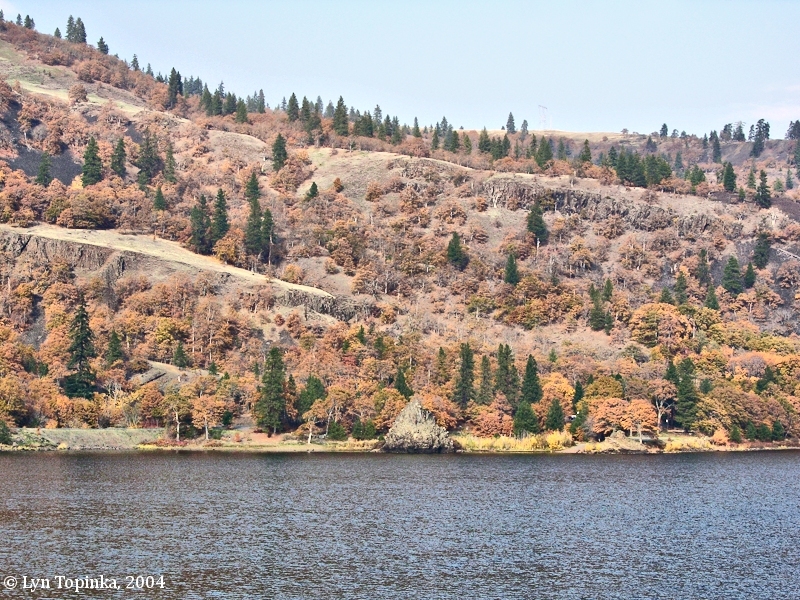 Rowland Lake has a large Washington State Department of Fish and Wildlife public access area that provides a shallow, gravel boat launch and a couple of pit toilets. The usual WDFW signs are posted -- "No camping or overnight parking." Too bad, it would be a beautiful place to camp with its many large oak and pine trees. Rowland has plenty of shore fishing opportunities for those without a boat. Source: &nbps; Bob Johnasen, February 17, 2007, "Small Lake Fishing for Columbia River Bass", IN: Northwest Fishing Reports website, 2017. Click image to enlarge Rowland Lake, as seen from Old Highway 8. Washington State Highway 14 runs through the middle of Rowland Lake. View looking west. Mount Hood is in the distance. Image taken May 8, 2017. 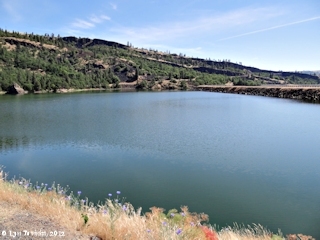 Rowland Lake is nestled in the natural amphitheater of Rowland Basin, with Rowland Wall being the massive basalt cliff which rises to the east of the lake. 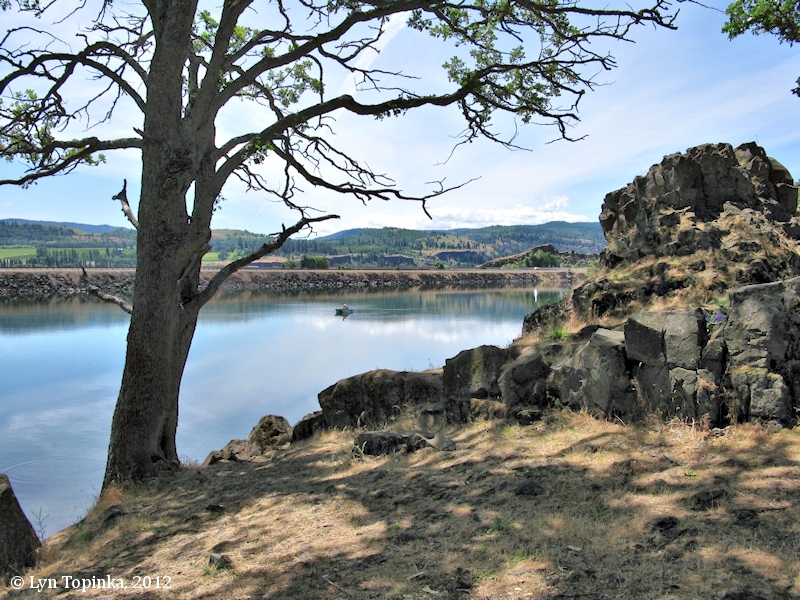 The west (downstream) side of the basin is known as the "Labyrinth", a maze of basalt rock piles. The Rowland Basin area has had human activity for "hundreds if not thousands of years". Click image to enlarge On Washington Highway 8 ("Old Highway 8") heading into the Rowland Lake amphitheater. Rowland Basin is a natural amphitheater. Image taken June 15, 2012. 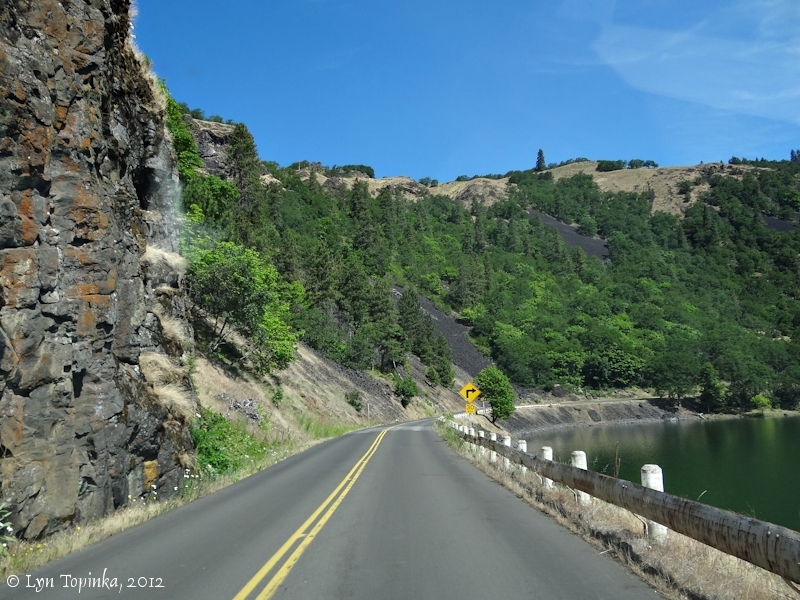 Click image to enlarge On Washington Highway 8 ("Old Highway 8") heading into the Rowland Lake amphitheater. Rowland Basin is a natural amphitheater. Image taken April 19, 2018. Click image to enlarge Rowland Lake, Washington. Rowland Wall rises above. 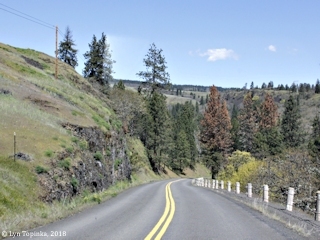 View from Old Highway 8, just off of Washington State Highway 14. Image taken June 15, 2012. 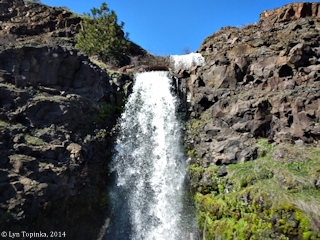 Rowland Lake Falls is an unofficial name for a waterfall on an unnamed creek just west of Rowland Lake on the backside of Coyote Wall. During high water it is visible from Washington State Route 14. 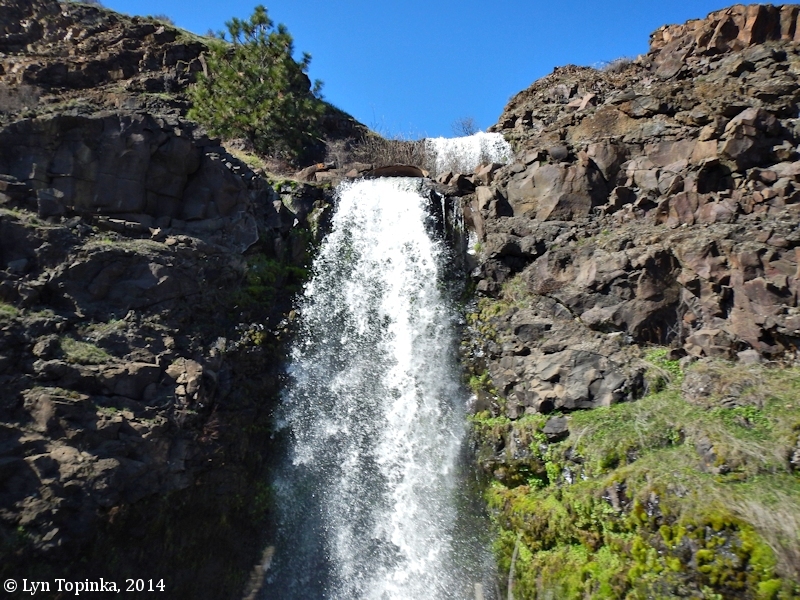 Click image to enlarge "Rowland Lake Falls", an un-official name for the un-named drainage west of Rowland Lake. View from moving car heading west on Washington State Route 14. Image taken March 12, 2014. Today's Rowland Lake was once known as "DeBois (DuBois) Lake". The May 20, 1954 edition of the "Mt. Adams Sun" (Bingen, Wa.) includes the fourth chapter of the "Rowland Saga", a written history/story of the Bingen/Rowland/Lyle area. 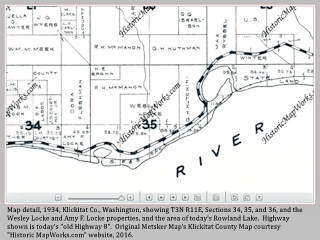 It includes references to Rowland Lake/Debois Lake, written by Harriet Crank from an interview with Ira Rowland, "Klickitat county's oldest-living native son". "After my folks left Curtis Mountain we moved to Rowland Lake, where I. A. DeBois now lives." Roland/DeBois Lake of today was formed by the rising waters of the reservoir behind Bonneville Dam. "... Construction of the Bonneville Dam created Rowland Lake in the 1930s. As aerial photographs from the 1930s show, Rowland Lake was formerly a marshy flat area in the bottom of a natural amphitheater (i.e. the Rowland Basin). Most of the slopes within the amphitheater are steep and covered with talus or trees, but a few flat, grassy slopes poke up through the trees like islands. ..."
"... Orginally an arm of the Columbia River. The lake was formed by fill when the railroad was constructed here. The lake was originally called DuBois Lake and is better known by that name locally. ..."
The October 15, 1937 edition of the "Mt. Adams Sun" (Bingen, Wa.) mentions the lake. "Condemnation proceeding will be filed by the United States government against I.H. DeBois which probably will come to court on October 25th. Mr. DeBois, who owns the DeBois lake east of Bingen was notified this week, that due to rising waters from Bonneville dam to come on December first, the lake will be condemned. The water will raise 6 feet to the 67 1/2-foot level. That is about 4 1/2 feet below the yellow stakes. The case comes to a Yakima Federal court." Source: "Mt. Adams Sun", (Bingen, Wa. ), October 15, 1937, Mt. Adams Sun Archives, 2017. 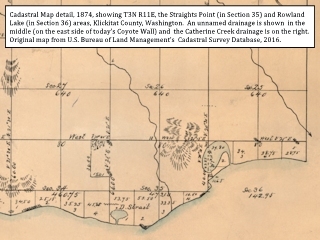 Click image to enlarge Detail, 1874 Cadastral Survey Map of T3N, R11E, showing locations of today's Straight's Point (in Section 35) and Rowland Lake (in Section 36). 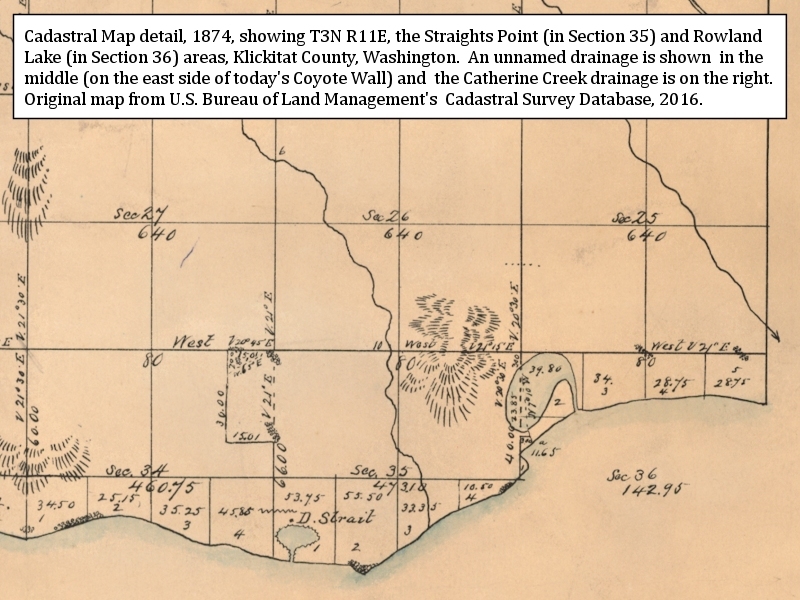 Original map courtesy U.S. Bureau of Land Management's Cadastral Survey database, 2016. 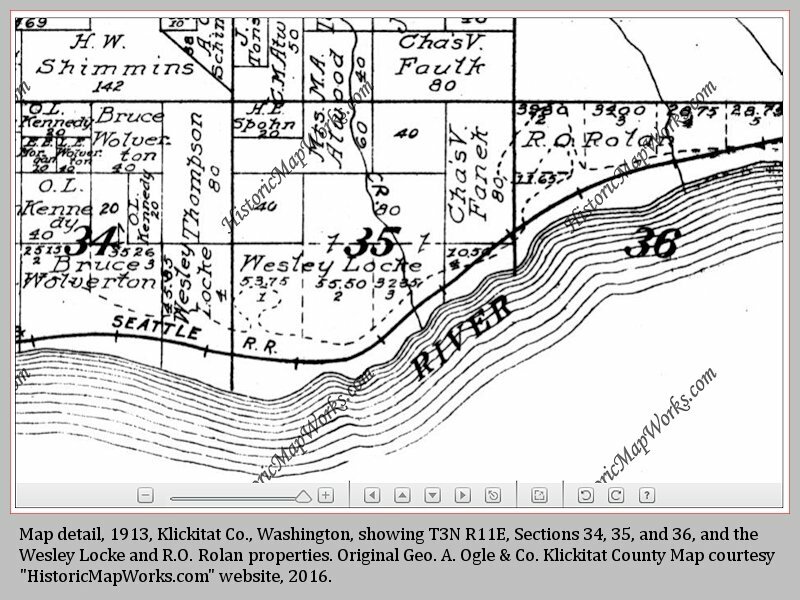 Click image to enlarge Detail, 1913 Klickitat County Map showing T3N, R11E, Sections 34, 35, 36, and the Wesley Locke and R.O. Rolan properties. Original map courtesy "HistoricMapWorks.com" website, 2016. 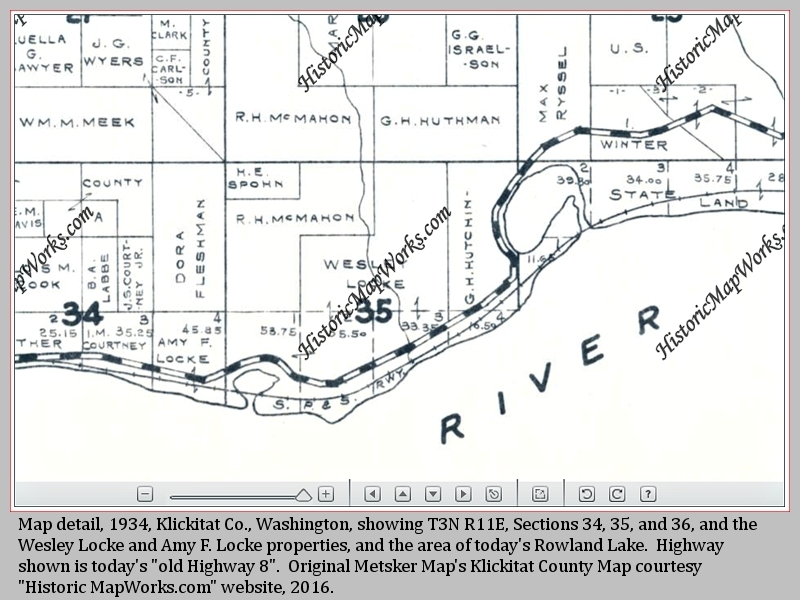 Click image to enlarge Detail, 1934 Klickitat County Map showing T3N, R11E, Sections 34, 35, 36, and the Wesley Locke and Amy Locke properties, and the location of today's Rowland Lake. Highway shown is known as today's "old Highway 8". Original map courtesy "HistoricMapWorks.com" website, 2016. IN 1996 the "Rowland Basin Site" (also known as 45KL327) was added to the National Register of Historic Places, with a historic function of Religion and Ceremonial Site (#96000724), with dates represented from 1900 to 500 AD. Click image to enlarge Rowland Lake and Rowland Wall, Washington. Rowland Wall is the east side of the Rowland Basin. View from Old Highway 8. Image taken June 15, 2012. Click image to enlarge Two halves of Rowland Lake, as seen from Old Highway 8. Washington State Highway 14 runs through the middle of Rowland Lake. View looking west. Mount Hood is in the distance. Image taken June 15, 2012. Click image to enlarge Rowland Lake, Washington. Rowland Wall rises above. View from the west. Image taken November 11, 2004. 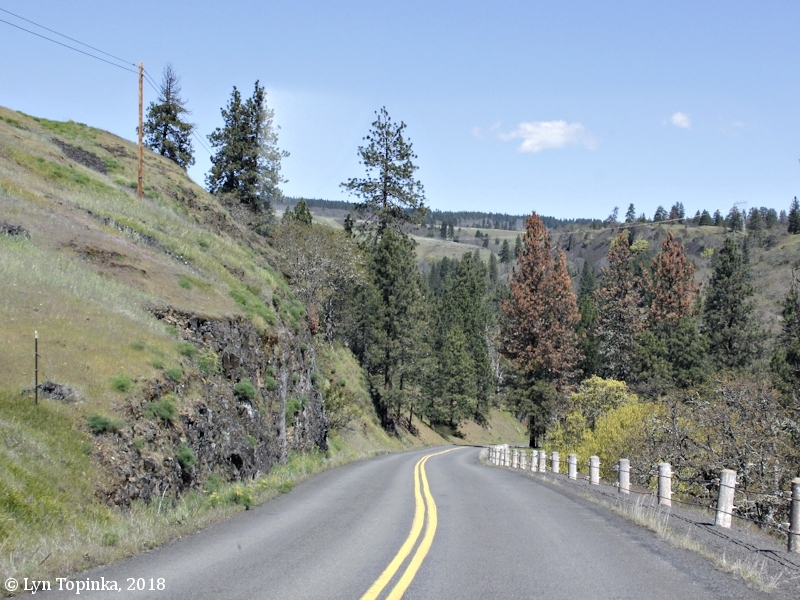 Click image to enlarge Old Highway 8, road along west side of Rowland Lake, Washington. 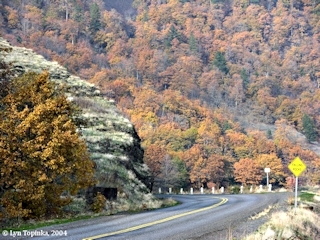 Image taken November 11, 2004.